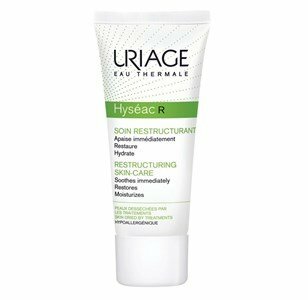 Hyséac Restructuring is the ideal ally of oily, irritated and parched skin. Restructures and strengthens the skin barrier, respecting its natural physiology, thanks to Cerasterol-2F ®, an innovative patented complex. A care that allows optimal observance of dermatological treatments, restoring an immediate comfort and a long-lasting hydration. Apply 1 to 2 times per day on perfectly clean and dry skin. Suitable for oily skin, fragile by anti-acne medical treatments. Oily skin also needs to be properly hydrated. The care should be daily and mattifying, avoiding excessive brightness. Light, non-comedogénic and "oil-free" textures, combined with the unique scent of Uriage Hyséac line of care.